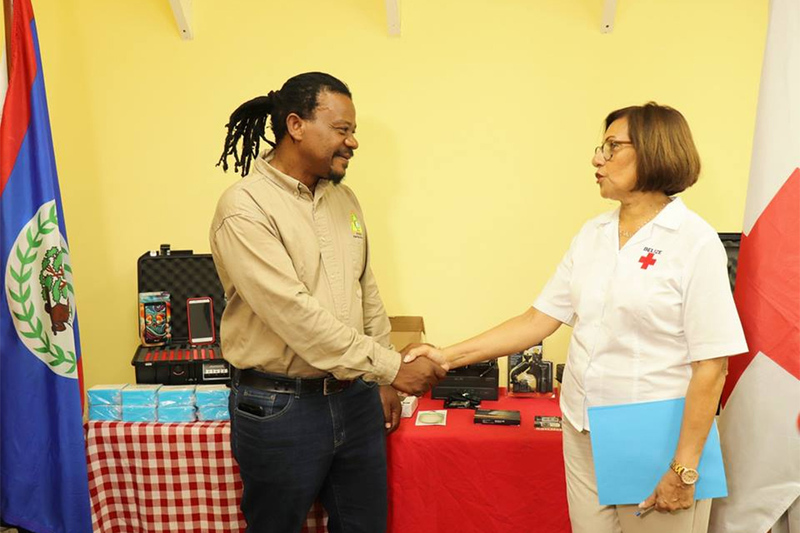 On Thursday, January 17, 2019, Minister of Transport and National Emergency Management, Hon Edmond Castro, received on behalf of NEMO a donation of equipment from the Belize Red Cross to assist in disaster preparation and response. Making the donation on behalf of the Belize Red Cross was its Director General, Lily Bowman. The donation valued at over $20 Thousand includes a Drone, Portable Open Street Map Server and Open Data Kit, all used for data collection in Community Development & Resilience, Accountability & Transparency in Disaster Relief Operations. The donation follows a week of training for NEMO personnel in handling and operation of photographic Drones, Satellite Imagery and GPS, facilitated by the American Red Cross and conducted at the Belize Training and Employment Centre (BTEC) Training Room on the ITVET Compound in Belize City. The training and donation are part of an overall project titled, “Strengthening Partnership through Accountability and Transparency” to assist villages throughout Belize District, funded through the United States Embassy.